Dracaena corn plants (Dracaena fragrans 'Massangeana') belong within the family Agavaceae. This evergreen, perennial shrub thrives outdoors in frost-free areas of the United States. 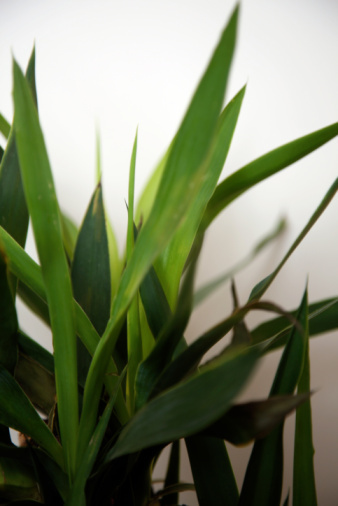 Plants grow slowly, reaching up to 15 feet tall at maturity. Sword-like leaves reach up to 1 foot long and grow in bunches at the top of tall trunks, or canes. Plumes of fragrant white flowers bloom periodically year-round. Plants are suitable used as specimens, houseplants, or grown in containers or planters. Gardeners can prune corn plants to control its size, or start new plants from the cuttings. The leaves on a corn plant can live up to two years. Wipe the blades of loppers or pruning shears off with a cloth dipped in alcohol or bleach to sterilize pruning tools before cutting the corn plant. This kills any bacteria or diseases on the blades that can infect the corn plant through the fresh cut. Trim off green branches or shoots using pruning shears, if doing a light pruning to the corn plant. Cut off the branch at the desired location, or flush with the trunk. The branch will sprout two to three new stems in cuts not made flush to the trunk or cane. Trim through thick cane sections using loppers. Select the area on the corn plant's trunk you desire to cut it back to and slice through the area using loppers. Two to three new branches will develop where you made the cut. Prune off a trunk or cane flush to the ground, if pruning away multiple trunks. Cut the cane off using loppers and pile soil on top of the cut so it does not sprout back. Use this method if you desire a single-trunk corn plant, or desire to eliminate a trunk. Trim off plumes of spent blossoms. Use pruning shears and trim the dead flower section back to the foliage.